Yes, yes, I know. There are already far more views on this than I would normally even consider for posting to the blog. But you will have to forgive me for the following reason: the Dude's Hallowe'en costume. 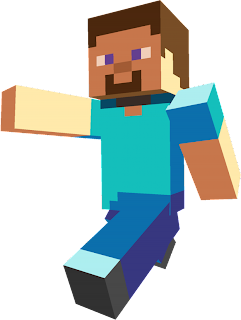 In case your kids don't play Minecraft, this is the protagonist Steve. He lives in a 32-bit world and mines minerals and other materials in order to build structures and defend himself from zombies and creepers (green monsters). The Dude gets a couple of hours of game play per week, but to hear him talk, you'd think it's all he does with every waking minute. That level of obsession meant that this was the perfect costume for him this year. 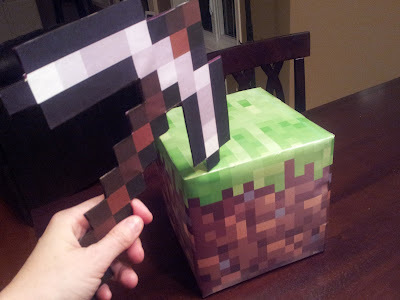 These are homemade cardboard versions of Steve's pick-axe and a dirt block (which is the most common material in the Minecraft universe). And so, in honour of his costume, I present to you Minecraft (Gangnam) Style. If you know nothing about the game, well, you still won't know anything about it after watching this. But it's fun. So that's something. (I especially like the part at 2:32 when all the characters bust out into the signature dance moves).